Ever thought what will happen when you’ll be celebrating the Valentine’s Day with your partner and suddenly BAJARANG Dal appears in front of you? Probably the thing you never expect to happen on this day!The very next moment you and your partner might find yourself being harassed by these so-called ‘Moral Policing party’. Whether it’s Shiv Sena in Maharashtra or Bajrang Dal at other cities, every year we get to see on the news that couples getting harassed for spending quality time with each other in public places in broad daylight. With their extremely aggressive and impolite behaviour, the activists manhandle the couples and the level of harassment they went through is unbearable. But this time, the Commissioner of Bhubaneswar, Satyajit Mohanty has made it clear that the local police will keep a Zero Tolerance agenda on Valentine’s days towards any party who will try to harass the couple during V-Day celebration. The police will do a regular patrolling and keep their team in every public place of Bhubaneswar and Cuttack to stop those kinds of anti-social elements. Hopefully, this time it will work. 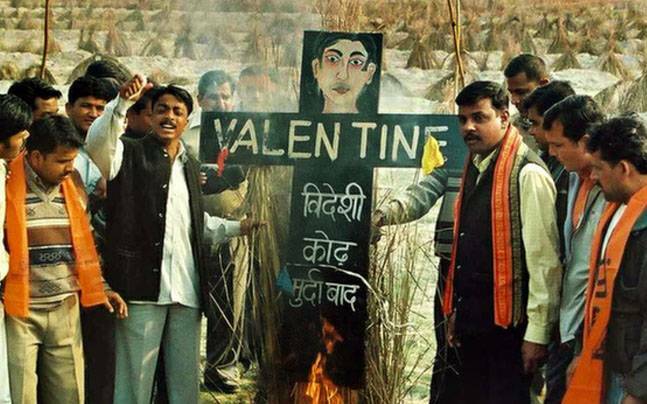 In another report, it has been reported that Bajrang Dal has taken up a more civil approach to ‘fighting the evils of western civilization’ and will counsel the youngsters against V-Day celebration.